Giant Clam Pearl -- Have You Found One? Found a Giant Clam Pearl? A giant clam pearl can almost take one's breathe away....they can be sooo large, like this one in the photo below. You can tell by the comparison with the man's hands that it is really huge. They can grow large enough to fill a man's hand and even the largest pearl on record, Pearl of Lao-Tse, is from this mollusk, the Tridacna Gigas. You are invited to show us a photo or video of your pearl and tell us all about finding it. Have You Found A Giant Clam Pearl? Do you have a great story about finding a pearl in the Giant Clam? Share it! Undoubtedly, the Giant Clam (Tridacna Gigas) can grow the largest pearls...the largest pearl in the world is from this mollusk and other large pearls have also been found. You can see another giant pearl on my homepage. I invite you to show a photo and tell your story of finding a pearl from the Giant Clam. 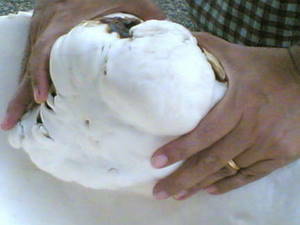 I have a giant clam pearl its about 12 kolos, and I'm looking for a buyer of that pearl who can help me to find a buyer. Could this be a Tridacna Gigas Pearl? I found a one ton oyster with a pearl as big as my hand in the pacific ocean while fishing for leopard sharks. Fossilized Clam Shells with Blister Pearls? Go to main finding a pearl page after clam pearl. Read about the giant pearl pictured above.